It’s Friday, Hurray! Getting to friday always makes me feel like I’ve been running a marathon and finally made it to the finish line. Does anyone else feel the same way? If so, we made it!! Woo hoo! Now let’s get down to it. Here is a list of some products that I have been loving. It’s a little random so get ready for it. 1. Flora by GUCCI perfume- This perfume continues to be my favorite. I spritz some on and I instantly feel classy, chic, put together, and elegant; it never fails. 2. ORIGINS Ginzing eye cream- It says it is a refreshing eye cream to brighten and depuff. This is my go to eye cream when I want to look awake and bright when I’m really not very awake and bright haha. It really does work to brighten my under eye area and I can feel a subtle firming under my eyes. It is creamy with a orangey scent. I love this cream. 3. Bliss Fabulips sugar lip scrub- This lip scrub tastes sweet and gently exfoliates my lips leaving them soft and moisturized. 4. Little Remedies Saline Spray/Drops- Now I had to throw this in this week’s favorites because it has been saving me a lot of crying all week long(my little one and me lol). My little guy has been having boogies and then gets really frustrated and upset. I put a few drops in his nose and either use a tissue or the suction bulb to get the boogies out. My little guy hates the suction bulb so I try to avoid using it unless necessary. 5. NARS satin lip pencil in the color Rikugien- I received this from Sephora as my birthday gift along with another lip pencil. I absolutely love this color. It is slightly darker than my natural lip color which gives enhances my lips and makes them pop while still looking natural. It feels comfortable and soft. 6. H2O+ Targeted Care Hand and Nail Cream- It says that it smoothes skin and fortifies nails. I don’t know whether it fortifies nails because I haven’t seen much of a difference in my nails but it definitely moisturizes my hands. With a little one at home, I spend a lot of time washing my hands among other things, causing them to get unbearably dry. Whenever this happens, I use this hand cream and it soaks into my skin leaving my hands feeling hydrated and soft without feeling greasy. 7. White Barn Bergamot Woods candle- I got this candle at Bath and Body Works around Christmas time. I have kept it among others in one of my closets because I like to rotate my candles to coordinate with the seasons. I took this candle out this week and I’m obsessed with it! It has a manly cologne yet nature-like scent that’s intoxicating. It makes me want to be outdoors and for it to be fall already. 1. Tarte EmphasEYES smoldering clay liner in Plum- This was a product that I loved using because it was easy to apply and stayed on all day long. However, I tried using it this week and it’s all dried up and extremely hard to apply. And I have A LOT of it left too. It wasn’t used too often which makes me sad. I tried sharpening it, hoping that the inner layers would be fine but no luck there. It applies in dry patchy areas with some thicker and darker than others. Does not have a long shelf life. 2. Tarte Maracuja Creaseless Concealer-Says that it is full coverage, creaseless, waterproof, and long-wearing. This one was upsetting because I made sure to have one of the MUA pick my shade for me and assure me that it works great under the eyes and Does NOT crease. She applied it in store and it looked a little off but she assured me it was due to the lighting.Well I’ve tried it several times with several foundations and it makes my under eyes look slightly ashy and grey. Once the foundation is on, the concealer creases even if set with powder. I’ve tried numerous ways to see if it will work better but no luck. For me this concealer is way to heavy and thick for the under eye area and unfortunately for me the shade is way too light to be used as a regular concealer. Definitely a FLOP. My little guy turned 7 months old on the 18th and I still can’t believe how quickly time is passing by. He is now rolling all over and trying to crawl while biting everything in sight. Due to his newfound need for freedom and exploration, I have set up a “fort” for him with all of his favorite toys; as well as mine. 1. 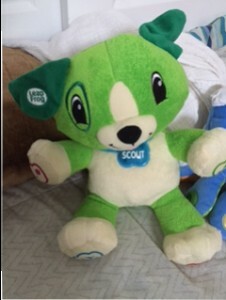 Scout by Leap Frog- This green dog is not only adorable but educational and programmable. It is a soft plush toy with a hard plastic light up button where his name tag is. On his right paw he has a bouncing ball design where when you push it, he states different things he likes, sounds, animals, etc. 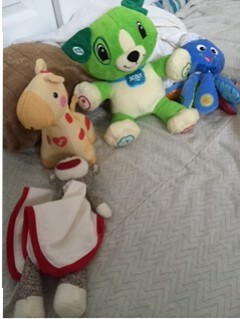 On his left front paw he has a music symbol where he plays different songs such as the itsy bitsy spider and personalized songs. His bottom right paw has a moon button where he plays 5 minutes of bedtime music. His right bottom paw has the power button where he says hello “name” and to power off. 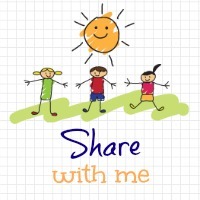 You can program personalized information such as favorite food, color, animal and your name. It is currently one of my little guy’s favorite toys. 2. 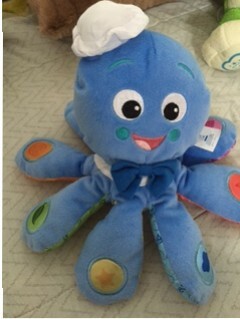 Octopus by Baby Einstein- This toy plays music and is a plush toy. The octopus has a different color on each tentacle and it states them in english, spanish, or french when you push each tentacle. When you push his head he plays a few different songs. This toy used to scare my little guy when he was 3 months old but he loves it now. He really enjoys the music while he chews on the octopus’ tentacles. 3. 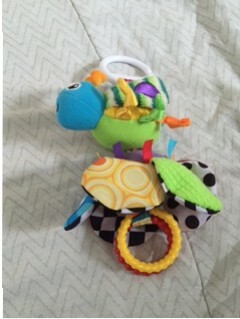 Flutterbug by Lamaze- This toy is a hangable stroller/carseat toy that vibrates when the flutter bug is separated from the flower. This is a great sensory toy. 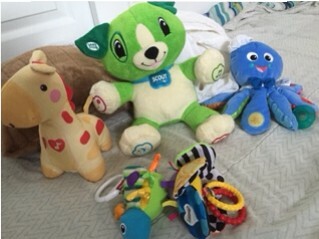 It has two rings that hang on the bottom that are great for teething. The flower as well as the flutter bug have different fabrics and textures to them.The flower petals make crinkle sounds when touched and the flutter bug vibrates when the flower is pulled. This has helped a lot during car rides or trips inside stores. 4. Security blanket monkey by Baby Starters- This is a soft plush monkey with its midsection being a small blanket. Its head is a rattle. My little guy loves this toy when he is sleepy and just wants to hold on to something. It isn’t too stimulating so it doesn’t bother him when he is sleepy. 5. Giraffe by Fisher Price- This toy I have mentioned before. It is a plush giraffe that has a midsection that lights up and plays bedtime music. After a few minutes the light dims until it eventually turns off altogether. You can turn it off by pressing and holding its midsection. 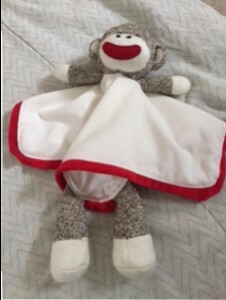 This is my little guy’s all time favorite sleep time toy. It relaxes and soothes him. He likes to stare at the light as well as chewing on the giraffe. (He’s currently teething so he pretty much chews on anything and everything). I think I will be starting a weekly friday favorites and flops post about what I am currently loving from cosmetics to baby items and anywhere in between. Purity face wash by Philosophy; Clarisonic- I have been using Purity by Philosophy face wash with my Clarisonic and I really like it. It has softened my skin and brightened it. I use it in the shower because with a baby, time is of the essence. Herbal Essences Shampoo and Conditioner – I am LOVING the rose scented shampoo and conditioner. It leaves my hair feeling soft and clean with an amazing scent. Ocean Salt Face and Body Scrub by LUSH– Absolutely love this. It makes me feel like I’m at the beach and instantly relaxes and revitalizes me. Leaves my skin feeling super soft. I use it a few times a week. Clinique Chubby Stick in #16 Voluptuous Violet– It gives my lips a light wash of color and keeps them moisturized. My go to lip product lately. Easy and fast. Pacifier Wipes by Munchkin– I love these for on the go. With a 6 month old, I spend A LOT of time picking up pacifiers that he had thrown EVERYWHERE. If I’m not able to wash them, I use this to clean them so that he does not scream bloody murder because he can’t have his pacifier back. If he has dropped the pacifier somewhere that I think is really dirty I don’t let him use it just to be safe. It says that it is alcohol free, no harsh chemicals, and natural cleaning with baking soda. A Darker Shade of Magic by V.E. Schwab– I am currently enjoying this book although it has taken me a long time to finish it with only being able to read a few pages a day. Mom life at its finest. It is a mix of science fiction and fantasy.